It is Global Tiger Day on Saturday (29th July). To celebrate we would like to tell you about the trip Dr John Lewis, our big cat expert, took to the Russian Far East earlier this year and give you some fundraising ideas, should you like to support us. Dr John Lewis, big cat expert and one of WVI’s Veterinary Directors, made a return trip to the Russian Far East at the beginning of 2017. Although John has been advising local vets and conservationists remotely, it had been several years since his last visit. This was an excellent chance to catch up with developments in person. John visited the Alexeevka Tiger and Leopard Rehabilitation Centre, where orphaned, injured and sick animals are looked after before being returned to the wild. Situated near the city of Ussurisysk in the Russian Far East, is designed in such a way that contact with humans is minimised while animals are undergoing treatment. This is vital if they are to stand any chance of successful rehabilitation back into the wild. As soon as animals are through quarantine and essential veterinary treatment, they are moved to large outdoor pens, where they are monitored remotely by CCTV as far as possible. While WVI has supported the work of the Alexeevka Rehabilitation Centre for a number of years, this was the first time John has had the opportunity to see the facilities for himself. He was able to have detailed discussions on site with the dedicated local staff, Victor Gapanov and Katia Blidchenko, who work in extremely demanding conditions. This was a chance to appreciate the veterinary problems at first hand, as well as deliver some vital equipment. John already works remotely with the centre’s in-house vet, Misha Gonchuruk, currently thanks to a grant from IFAW Russia. As a result of this visit, WVI now has a deeper understanding of the challenges the centre faces and will be able to advise even more effectively on its ongoing work. While he was there, John was able to help with the initial care of a severely injured young tiger cub, which arrived at the centre with serious wounds to his head, the cause of which was unclear. In subsequent weeks the cub (Pozhar) made good progress, was put in to a large enclosure with a rescued female cub and may even be able to be returned to the wild. 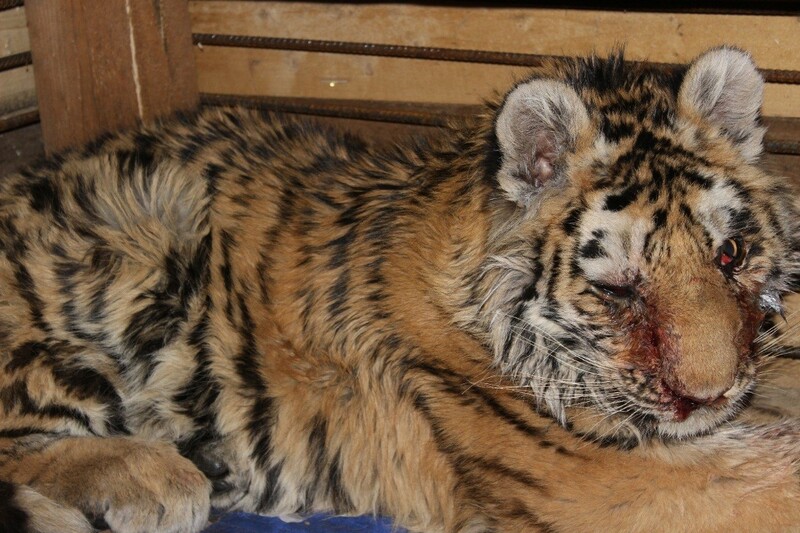 Injured tiger cub 'Pozhar' Although the rehabilitation of orphaned or injured animals doesn’t usually play a part in conservation, when the species in question are as rare as the Amur tiger and Amur leopard, then saving every individual counts. While not quite as rare as the Amur leopard (numbering ~70), there are thought to be only 350-450 Amur tigers left in the wild. An xray of the 'Pozhar' tiger's broken zygomatic arch. Would you like to support our work with tigers across its range by fundraising on #GlobalTigerDay ?? Sell tiger buns, tiger craft and homemade lemonade at a local fete? to weary walkers on a popular footpath (don't forget to ask permission from the land owner). Sponsored activity? Captions, clockwise from top left: Grrrrrr Yorkshire 3 Peaks in a tiger onesie; Tiger comes to tea; Heptonstall 1st Brownies do Tiger comes to Tea; WVI Supporter, Freddie, sells badges at a Jungle Sale; Pin the Tail on the Tiger Have a ROOOOAAARRRRINGLY good time. All in all, have fun and remember every penny counts. Dr Lewis is very grateful to the Primorsky State Agricultural Academy for facilitating his trip, and to his hosts Misha Gonchuruk and Linda Kerley, who are in turn both supported by the Zoological Society of London. This trip and our Tiger Health Programme generally is possible thanks to financial support from Big Cat Sanctuary (formerly Wildlife Heritage Foundation), Colchester Zoo, IFAW Russia, Photography for Big Cats, Shepreth Wildlife Conservation Charity, Zoological Society of Hertfordshire (formerly Friends of Paradise Wildlife Park) and many individual supporters. We are all particularly thankful to all those who run through mud, bake cakes and give up their time to raise funds for WVI.